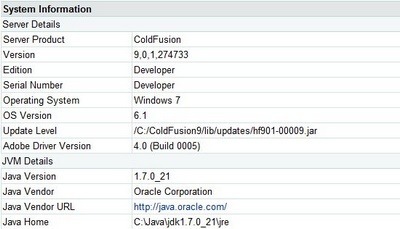 Java has recently put out a patch that certifies ColdFusion 9 to run with Java JDK 1.7.0_15 or newer. 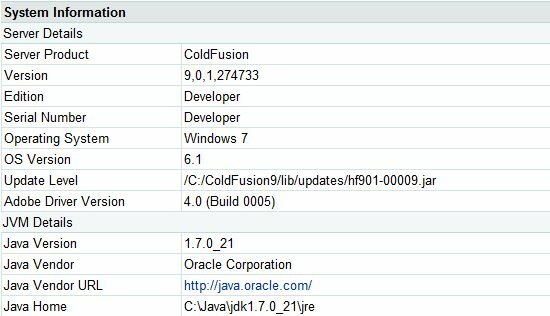 After applying the patch, upgrading to Java JDK 1.7.0_21, and manually copying a DLL, this ColdFusion 9.0.1 installation finally runs with Java JDK 7. Java JDK 7 Download and install Java JDK 7 build 15 or newer from Oracle. 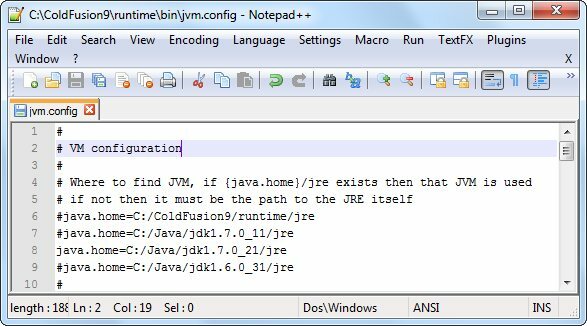 For ColdFusion to use the newer version and new installation of Java, this could be accomplished by either using the ColdFusion administrator or by editing the C:\ColdFusion9\runtime\bin\jvm.config file. To edit the jvm.config file, stop the ColdFusion services. Open the file with your favorite text editor. Change the default java.home to the new location and save the file. After applying all the updates to ColdFusion and after upgrading to Java JDK 7 build 21. ColdFusion 9 Application Server would not start. A possible solution was offered in this forum to copy C:\Java\jdk1.7.0_21\jre\bin\msvcr100.dll out of JDK 7 and put it in CF9\runtime\bin. After applying this work-a-round to the install, the ColdFusion 9 Application Server started without error. While in ColdFusion Administrator, the System Information reflects that the Java Version is 1.7.0_21.